Rosanne, like her daddy before her, straddles the boundaries of American music. But, because she’s a Cash, everybody thinks country. Well that’s fine, but it’s Country with a capital “C”. And “C” stands for craft and that is what truly differentiates Rosanne from most of the singer/songwriters out there. Everything she does is “just so.” No histrionics, no virtuosic displays, no self-indulgent wordplay. Her tempos and vocals remain firmly in the middle range. The songs themselves are, however, “river deep and mountain high.” Consider them as you might a piece of classic Shaker furniture – unadorned, purposeful, beautiful and unmatched in the perfection of their simplicity. As ever, John Leventhal’s contribution cannot be overstated – producing, arranging, playing most everything, and co-writing the songs. 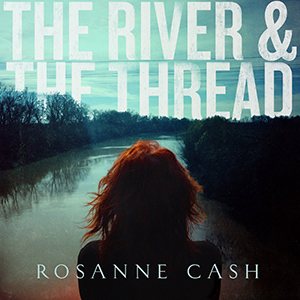 Theirs is a true partnership and The River & The Thread is an album for the ages.